Home > Blog > Ecommerce > Relax With Cool Head Pillows! 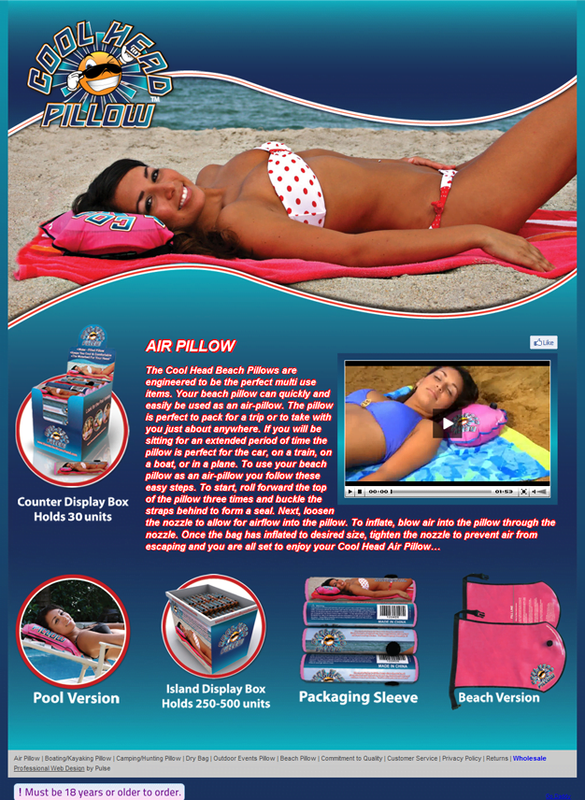 www.coolheadpillow.com presents you with a refreshing approach to relaxing on summer sands. Even better, cool head pillows don’t have to only be designated to beach days! They can be utilized to give you a refreshingly restful approach to long sweaty drives, hot fishing days, blissfully reclining on the deck of a boat, or even when attempting to sleep while travelling by train or plane! Cool head pillows can either be filled with cool refreshing water, cold water with ice cubes, or even just thin air. This unique feature gives cool head pillows a whole new meaning and so many different uses! Cool Head Industries needed a website that could display the benefits of using cool head pillows. They wanted a website that was colourful, attractive, and closely resembling a summer day in the sand. The website for Cool Head Industries had to be catchy, informative, and inspiring. Pulse Solutions created a website for Cool Head Industries that was engaging, colourful, and informative all at the same time through using C#/.Net Framework 3.5, SQL Server 2008, and Ecommerce. The website was most effective in displaying the many relaxing benefits and refreshing uses of cool head pillows. Because of the website’s simple but relaxed and fun loving approach to improving relaxation and taking a break, individuals are able to relate and even feel inspired by the idea of making vacations that much more refreshing. Needless to say, Pulse created a whole new meaning to chilling out and relaxing during the summer for real!